← Where do you Find all of those Coupons, anyways + What do You Do with them Next? Fall can be a challenging season for air drying laundry. This fall has been a dream for this dryerless dame – lots of sun and just the right amount of wind to keep the “smells” of autumn at bay (think farming community!). Thanksgiving Sunday was no exception and even though we were hosting family for dinner, I couldn’t resist the opportunity to hang out a couple of loads first thing in the morning. Everything, including jeans, was dry by 4 and I opted to tuck the dryer racks under the gazebo instead of hauling them to the basement to fold later. It’s not that it would have taken more than a couple of minutes to move the 3 racks, it was more a question of “where will I be most motivated to fold the clean clothes tomorrow?“. I choose the sunny backyard view over the basement, any day! Last night it rained. No, it poured. And the outer perimeter of clothes got drenched. Thankfully it’s sunny today and I’m confident that the laundry will air dry again with no damage done. If it had been a wet day today, though, a trip to the laundromat to use the dryers would have been in order. So far, in the past year, we’ve only had to do that once. Everyone has their “eek, I’m flying to Cuba tomorrow” underwear emergencies every now and then, right?! 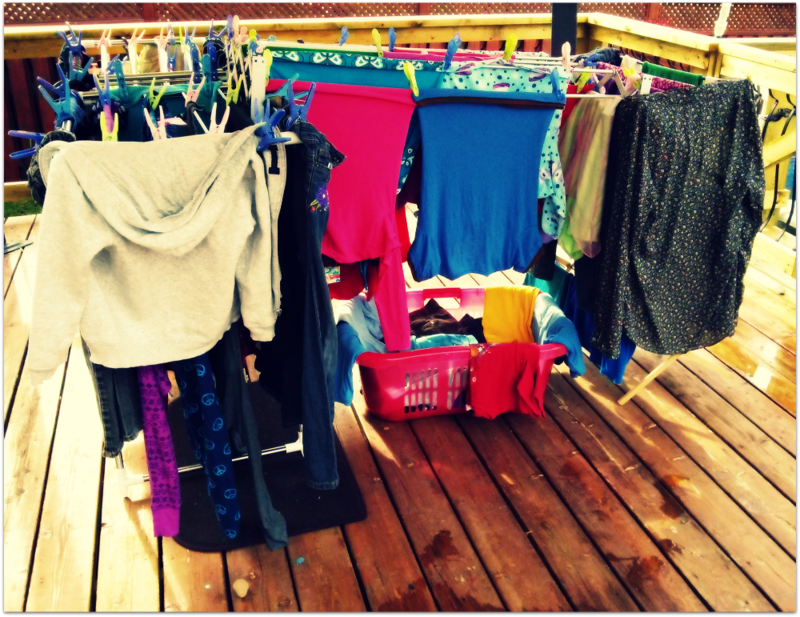 Our 10 month total spent on drying clothes is holding steady at $3. Posted on October 14, 2013, in Christa Clips, Hydro Savings, Laundry Tips and tagged Christa Clips, Diary of a Dryerless Dame, Green laundry tips, Saving money on laundry. Bookmark the permalink. 2 Comments. I miss my clothesline SO MUCH. Although if you can stick drying racks in your back yard, maybe I should do it too. I do have two in my laundry room so I only dry heavy stuff – what do you do with sheets? I’ve sooo enjoyed connecting online on various channels this week, Allison!